You don't need to spend more than a few minutes in the modest pro shop or around the courts at Tops'l to begin to sense an almost palpable enthusiasm for the game and its players. Drop in unannounced, and the first question someone is likely to ask is not "Can I help you?" but "Are you looking for a game?" You're made not simply to feel welcome but wanted, even needed. Without actually stepping on the courts you can sense that tennis matters there, and despite competition from an alluring beach, you find yourself nonetheless being drawn back to the racquet club just to be part of the action and camaraderie. Depending on your perspective, Tops'l is either a tennis resort with a beach or a beach resort with tennis, but either way there is no competition from golf or any other recreational amenity. That alone underscores the high value the resort puts on tennis. But it's one thing to offer tennis as an amenity, quite another to ensure that guests take advantage. And the entire staff, from tennis director Joe D'Aleo on down behaves as if the racquet club were not so much a workplace as a second home. Their enthusiasm and personal attention helps make Tops'l a haven for vacationers who themselves want to spend hours on the court. Tops'l opened in 1985 on 52 beachfront acres adjacent to the Topsail Hill State Preserve. The architectural motif throughout is toned down Mediterranean, with rough cream-colored stucco and red tile rooms. There are numerous one- and two-story condos to either side of the entrance road and around the tennis courts. Most of the development, however, is concentrated along the beach, where several tall towers rise behind the primary dune line. These overlook another stretch of magnificent Gulf Coast beach, all white and high dunes. The newest of those towers has 164 2- and 3-bedroom units with balconies and oversize windows. Between it and beach is very large pool with an expansive deck, private bathhouses, and cabanas, whirlpools, and a small poolside restaurant called the Pavilion for lunch and snacks. All of this is linked by an on-property shuttle. Although I'd prefer not to look up from the beach and see that cluster of monoliths, I am otherwise a huge fan of Tops'l. Part of its appeal is directly attributable to the genuine enthusiasm of its tennis staff, and part to the resort's focus on tennis. There is no golf course here to divert attention from what's happening at the 12-court tennis complex. And in fact because that complex also has an exceptionally well equipped and well staffed fitness center—which includes indoor and outdoor swimming pools—the courts are a more than usually appealing place to hang out. The tennis complex and clubhouse consists of 12 Rubico courts (a kind of clay), one of them a small stadium, and 10 of them with lights. All have been laid out on a series of terraces each protected from the wind by the surrounding townhouses and pine trees. Recent renovations to the club have included a new Club Tiki bar and restaurant next to the club pools. The interior of the clubhouse also received attention in the form of an updated steam room and sauna. Walkways, grass, and shrubs separate one pair of courts from the next. And each pair of courts has a patio covered by a large blue awning for shade and furnished with chairs and tables and water coolers. The club has some 650 members, about 100 of whom live locally. Tennis Staff. 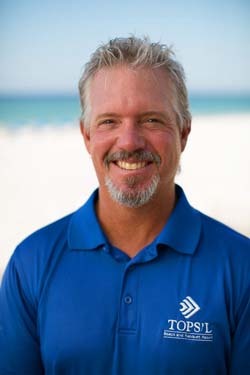 Joe D'Aleo the Director of Tennis has been on staff at TOPS'L for over 19 years. He has an affable personality and devotion to the game, which ensures a great atmosphere and enthusiasm for tennis and tennis players. 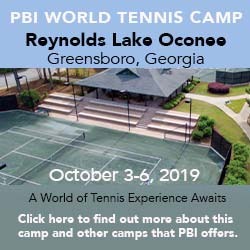 A USPTA-certified elite professional who played for Georgia Tech, he brings both teaching and playing skills to the position. "TOPS'L is all about tennis and making sure that all of our tennis guests feel like they are members," he says of his approach. "We always go the extra mile to make sure all of our guests get all the tennis they need during their stay." Sharing his enthusiasm and approach is head pro Sam Vickroy and Assistant pro Tyler Marengo. Tennis Programs. Tops'l has a tennis desk whose staff devotes much of their time to setting up games. During the busy summer, there is also an active weekly calendar of clinics, drill sessions, and round robins, including a Play with the Pro clinic and a very well attended Saturday morning mixed social round robin. That last event draws as many as 40 players and is successful because D'Aleo does not simply throw players together but instead invests time and effort in trying to match everyone according to their level. In the spring and fall, TOPS'L has been very successful in recruiting league teams to come down for long weekends by offering a combination of clinics, round robins and tournaments. These have proven to be very popular. All in all, TOPS'L offers 13 different tennis packages, variously for individuals, groups and teams or they can customize a tennis package to fit your needs. Beach. Those towers notwithstanding, the resort has been sensitive to the natural environment. The tall dunes along the beach remain intact, and so to reach the broad boulevard of white sand you cross over the dunes on a wooden boardwalk. In spring, scrub magnolias bloom right on the dunes as does purple-flowered Florida rosemary. Golf Courses. A complimentary 18-hole mini course aside, TOPS'L does not offer on-site golf, though arrangements can be made to play locally. Spa & Fitness Center. The fitness center at the courts has a large, well-equipped, spaciously laid out, and well-staffed workout room with floor-to-ceiling windows overlooking the courts. Other facilities include indoor and outdoor swimming pools and a racquetball court. Aerobics, yoga, and water aerobics classes are also available. There is a massage therapist on call at the Racquet Club (there are two massage rooms at the tennis center). Just outside the entrance to the resort is the Blue Heron Spa, an independent operation that offers a more extensive array of services. And ... A lighted fitness trail (much of it asphalt) with 20 Parcours stations runs from 1¼ miles, from the beach condos around the courts and back. From Memorial Day to Labor Day, Tops'l operates a camp for children ages 5-12. It consists of a variety of activities, mostly outdoors, and runs from 9 a.m. to 2 p.m. Monday through Friday (and includes an afternoon junior tennis clinic). Babysitting services can also be arranged. Lodging at Tops'l consists of 1-, 2-, and 3-bedroom condominiums. All are privately owned and furnished to the tastes of the owners, which means no two are alike. In order to be in the resort's rental pool, however, they must meet minimum standards of upkeep and amenities, including televisions and washer/dryers. The two-story units surrounding the fitness center and tennis courts and the midrise called Beach Manor overlooking the Gulf date to the 1985 when the resort opened. Since then two 15-story towers have been added: The Summit in 1996 and The Tides in 1999. The Ocean Club Restaurant at the entrance to Tops'l provides a convenient place for high-quality evening dining, complete with a live band for entertainment. Curiously, however, there is no place on property for breakfast (though the Sandbar Market & Emporium in the TOPS'L Clubhouse does sell some of what you may need to make breakfast), and only one place for lunch, the Blue Dunes Grill next to the pool on the beach. There is also a small outdoor Tiki Bar poolside. Lodging ranges from suites and studios to 3-bedroom condos variously located on or near the beach or around the tennis courts. Rates vary seasonally, but differ from those in southern Florida by being highest in summer and over Sspring Break, lowest in winter. See their website for specific prices for the dates that interest you. Seasons. High season here is May to Labor Day, when tourists are more prevalent; however tennis teams and groups of players tend to come during spring and fall. Travel Instructions. By Air: Although there are regional airports in Fort Walton Beach (VPS), 30 minutes west, Pensacola Regional (PNS), 90 minutes west, the new major gateway—it opened in late May of 2010—is Northwest Florida Beaches International Airport (ECP), roughly an hour's drive to the east in Panama City. Rental cars are available at all three. General Tourist Information. Visit the Emerald Coast Convention & Visitors Bureau website or contact them at 1540 Miracle Strip Parkway SE, P.O. Box 609, Fort Walton Beach, FL 32549-0609; phone 850-651-7131, toll-free 800-322-3319, or Fax: 850-651-7149.